I recently asked some friends on facebook and twitter what they would like to see more of on my blog. One of the ideas was to write more about my thesis, maybe give extracts. There is a hard line to balance here. If I put too much, publishers might view this as already published material and not wish to publish it themselves, but to do nothing at all is, to me unhelpful, since I believe in the sharing of ideas. For now, then I will occasionally post sections from my thesis, or do posts discussing the sections I’m working on. I’m not sure precisely how this will work out, so please bare with me. Below is a section from my first chapter wherein I try to describe how I define deification or theosis. Earlier [in the chapter] I mentioned the aspects that make up realistic and ethical deification Russell: participation and transformation for the former and imitation and virtue for the latter. While I will not be making the distinctions Russell makes concerning ethical or realistic deification, I do find this fourfold method of understanding the aspects of deification helpful. 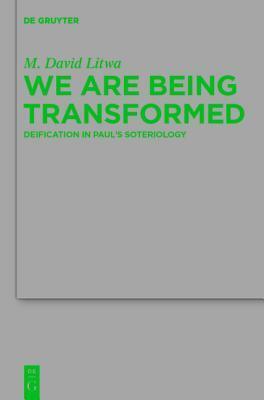 Each aspect of deification will now be examined, each in their turn, so as to understand what it is that makes up deification when it is examined in the subsequent chapters. These different aspects and defined below are interpenetrating. Particularly in the pairs of participation/transformation and imitation/virtue. However, it is equally not uncommon to see references made between the pairs. The first aspect of deification goes by several names: participation, grace, adoption, union. For this section I will look at examples of each of these four mostly synonymous terms. It would not be true to say that the existence of any of these terms in a text would equal a notion of deification. They are, however, all terms used often with deificatory significance. Now, this beginning notion in deification is that humans in general and Christians in specific derive all things from God. From a Christian understanding, the notion of participation finds its source in 2 Peter 1:4.1 However, the Platonic tradition was also essential to configuring a notion of participation for Christians. It would seem, that there are two ways participation ought to be understood. The first is the notion that by nature of our existence we, along with all created beings, participate in God. Yet, as noted above, the other terms that are often used as synonymous with participation, grace and adoption, suggest something more specific. Yes, all nature is graced, just as all nature participates in God, but only some are adopted. More on this below. It is important before continuing to note an interesting aspect of participation. Participation, especially as will be seen below in its synonyms is something that is simultaneously active and passive. As noted above, in one sense participation means that humans have being. This is not something in which we actively participate. It is passive, it is done to us. On the other hand, there are methods by which humans can actively participate in God (i.e. prayer, contemplation, etc.). This will be discussed in more detail when come to the section on Redemption and the life of the believer in chapter #. Instead, then, of trying to understand participation via active or passive voice, perhaps the grammatical middle voice would be helpful here. Normally, the middle voice would be evidence of reflexion, the subject does something to itself. In this case, however, the middle ought to be understood as meaning something that is both neither active nor passive, and active and passive. For now, let us focus on the specific kind of participation. As John Meyendorff suggests, ‘The view of man prevailing in the Christian East is based upon the notion of “participation” in God. Man has been created not as an autonomous, or self-sufficient, being; his very nature is truly itself only inasmuch as it exists “in God” or “in grace.”’2 This is true not only in the East, but in the West as well. Origen, one of the early figures says the Christian can become deified through the Son by participating in the Son’s participation in the Father. In order to realise this potentiality, it is necessary for Christians to have a life dedicated to prayer and virtue.3 Despite the suggestions of subordinationism, what Origen is suggesting is that a very specific kind of participation takes place between the Christian and Christ. This is more, beyond, the notion that all things which have being do so only via participation in God. Interestingly, even here in Origen, the notion of participation is not passive. It is not something that simply happens to a person, but it is something in which the Christian actively participates. Prayer, virtue, obedience are all essential to being deified. sin, so we had to be cleansed.’ (De Trin. 4.2.4)5 For Augustine, this participation cannot be of the kind by which all creatures exist, for it is only possible after purification. I will discuss more in my chapter on the Fall, why there are two kinds of participation, but for now, note well that for Augustine humans do participate in the Word, and that doing so leads to enlightenment. Another essential aspect of this second kind of participation is linked to Christ’s nature. Athanasius argues, according to Khaled Anatolios, ‘that the Son is proper to and not external to God by participation but essentially, whereas all other creatures are related to God by participation.’6 Deification, because it is so inextricably tied to the Incarnation means that in whatever sense humans are deified it must be by participation. Humans are not God by nature, but Christ is. In his becoming human he became by nature what humans are. Humans then can become what he is, but by participation. Clearly, participation references humans coming to what humans are not by nature. However, ‘It is the nature of created things to participate in external Forms because the Word of God, in whom all forms cohere, orders all things and connects them to himself, so that they reflect the Word’s unity and participate in the Word’s life.’7 So in one sense, participation is natural to us. It is what created beings do. However, the deificatory participation is that participation by which humans transcend what is natural to them and receive that which is non-natural to them. Each of these four terms––participation, grace, adoption, and union––are nearly synonymous. However, not well that while usually synonymous each can be, and often is, used in a slightly different manner. Nevertheless, grace is quite similar to participation, viz., it ought to be conceived of under two guises. The first is the idea that all nature is inherently graced. 8 As all creation is a gift from God, it is graced. However, there is a second understanding of grace, one that takes creation from where it is and moves it forward to transcend its current, specifically fallen state. Again, Weinandy shows that for Athanasius, ‘We remain creatures while becoming God by grace, as Christ remained God in becoming man by the Incarnation.’9 Especially in the early centuries, one of the key aspects of deification is that what Christ is and does by nature, humans can only do by grace (or adoption or participation). While safeguarding Christ’s divinity, the Fathers were equally reminding us that all we have, including deification, is ours only by gift, by the grace of God. I will look more deeply at the language of grace in the subsequent chapters, particularly the chapter on Redemption. ‘To know God one must draw near to Him. No one who does not follow the path of union with God can be a theologian. The way of the knowledge of God is necessarily the way of deification.’12 See the various ways Lossky describes deification: knowing, drawing near, union, deification. All these terms are centred around that concept of union with, for Lossky is synonymous with deification. Word must be both fully God and Son, John Cassian in De Incarnatione 3.217 turns to condescension and adoption. Humans, specifically Moses and the addressees in Psalm 82, are called gods by God not because of who they are but because God condescends to give them these titles. If, for Athanasius, men cannot be called sons and gods unless the Word is Son and God; for Cassian men can only be called gods because the true God so calls them. Cassian also briefly mentions adoption noting that Jesus is not called God by adoption but by nature. The implication here is that what Jesus is not called by adoption those others God has called sons are so called by adoption. in Mere Christianity, envisages it as change from bios to zoe: ‘A man who changed from having Bios to Zoe would have gone through as big a change as a statue which changes from being a carved stone to being a real man. And this is precisely what Christianity is all about.’18 While humanity’s being is always dependent on God for its existence, humans still do not have being as they were meant to have it. Therefore, the transformative aspects are as if humanity went from in-animation to animation. Lewis later compares the process to a tin soldier becoming an enfleshed one. The only problem is enfleshment is uncomfortable and at least remaining tin would not be different. Nevertheless, it is essential for the tin soldier to become flesh, for it was intended to become flesh all along, it just was not always intended to hurt.19 Simply going from tin soldier to an enfleshed one, however, is not all there is to it. For the model into which humans are being transformed is Christ. into whom humans are being transformed is Christ. He became what humans are, so humans might become what he is. Thus, the transformation is more than a return to the pre-fallen state. Instead, humans are to go beyond the point reached by Adam and Eve for we have the benefit of the Incarnation. Without Christ having become human, how could humans have ever hoped to become gods. It may only be done by participation/grace/adoption, but it happens only because he did the reverse first. Humans are not, however, the only ones transformed. Christ’s becoming a creature, has far reaching implications for all of Creation. As Vladimir Lossky writes, ‘The world thus created will always exist, even when time is abolished, or rather, since time itself is a creature, when it is transformed into the eternal newness of the apocatastasis.’21 I will explore this notion more, however, in the next chapter. The main emphasis of imitation is imitation of Christ. If Christ is the one into whom humans are being transformed, then it stands to reason that part of that process would be an active attempts to be like him. If Christ is truly God, then it stands to reason that we are indeed, attempting to be like God. Lewis notes Christ’s words in Matthew 5:48, ‘The command Be ye perfect is not idealistic gas, Nor is it a comment to do the impossible. He is going to make us into creatures that can obey that command. He said (in the Bible) that we were ‘gods’ and He is going to make good His words.’24 David Brakke writes that for Athanasius, ‘The available patterns [for imitation] included the biblical saints and more recent virtuous Christians, but the ultimate pattern was God and his word; thus, self-formation through imitation, in that one became as like to God as possible, was the ethical facet of the process Athanasius called ‘divinization’ (θεοποίησις).’25 This is reminiscent of Paul’s injunction that believers ‘join in imitating me, and keep your eyes on those who walk according to the example you have in us,’ (Phil 3.17). The idea being that as each of person endeavours to imitate Christ, she ought also look toward those in the past and in her times who exemplify imitation of Christ. The final main aspect of deification is the acquisition and employment of virtue. This, while seemingly the most active aspect of deification, is equally as passive as it is only through Christ that Christians can acquire and employ virtue. 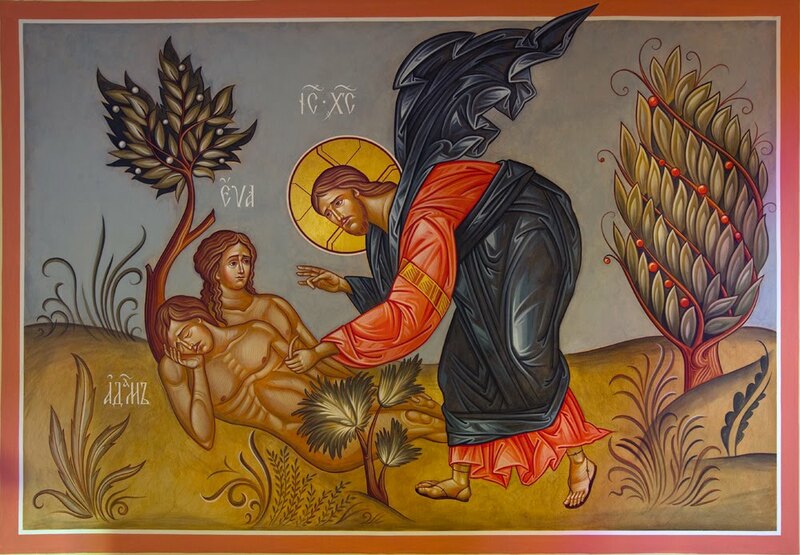 This acquisition of virtue is directly tied to the imitation of and transformation into Christ, for all virtues find their source ultimately in God. Daniel Keating reminds us, ‘It is important to recognize that when the Fathers speak of attaining virtue, they are not recommending a path of self-improvement or giving facile acceptance to moral practice in the ancient world. Rather they are issuing a call to “put on” Christ himself and the new way of life he teaches and models.’26 Deificatory virtue is not selfish. It is not a reference only to the individual, but the individual in relation to Christ, and to all of creation. I will return to the subject of virtue chapter #, but for now, it is enough to note these two things. First, virtue here must ultimately mean imitation of Christ. Second, virtue is something that the individual actively seeks to acquire, but must also be infused with by God. 2John Meyendorff, Byzantine Theology: Historical Trends and Doctrinal Themes (Oxford: Continuum, 1974), 138. 3 Norman Russell, The Doctrine of Deification in the Greek Patristic Tradition (Oxford: Oxford University Press, 2004), 142. 4 Carolyn Schneider, ‘The intimate connection between Christ and Christians in Athanasius,’ in Scottish Journal of Theology (58 (1), 2005), 11. 5 Augustine, The Trinity (De Trinitate), translated by Edmund Hill and edited by John E. Rotelle (New York: New City Press, 2005), 154-55. 6 Khaled Anatolios, Athanasius: The Coherence of His Thought (London: Routledge, 1998),105. 7Carolyn Schneider, ‘The intimate connection between Christ and Christians in Athanasius,’ in Scottish Journal of Theology (58 (1), 2005), 5. 8 I do not have the time to go into the grace and nature debates, here. 9 Vladimir Lossky, The Mystical Theology of the Eastern Church, trans. members of the Fellowship of St. Alban and St. Sergius (London: James Clarke and Co., LTD., 1957), 87. 10. Thomas G. Weinandy, Athanasius: A Theological Introduction (Aldershot: Ashgate Publishing, 2007), 99. 11 Paul M. Collins, Partaking in Divine Nature: Deification and Communion (London: Continuum International Publishing, 2010), 107. 12 Vladimir Lossky, The Mystical Theology of the Eastern Church, trans. members of the Fellowship of St. Alban and St. Sergius (London: James Clarke and Co., LTD., 1957), 39. 14. Thomas G. Weinandy, Athanasius: A Theological Introduction (Aldershot: Ashgate Publishing, 2007), 97. 15. Khaled Anatolios, Athanasius: The Coherence of His Thought (London: Routledge, 1998), 105. 16. Norman Russell, The Doctrine of Deification in the Greek Patristic Tradition (Oxford: Oxford University Press, 2004),178. 17 Give citation from NPNF. 18C. S. Lewis, Mere Christianity (New York: HarperCollins, 2001), 159. 19C. S. Lewis, Mere Christianity (New York: HarperCollins, 2001), 179. 20C. S. Lewis, Mere Christianity (New York: HarperCollins, 2001), 177. 21Vladimir Lossky, Orthodox Theology: An Introduction, trans. by Ian and Ihita Kesarcodi- Watson (Crestwood: St Vladimir’s Seminary Press, 1978), 61. 22 C. S. Lewis, Mere Christianity (New York: HarperCollins, 2001), 188. 23C. S. Lewis, Mere Christianity (New York: HarperCollins, 2001), 189. 24C. S. Lewis, Mere Christianity (New York: HarperCollins, 2001), 205. 25. David Brakke, Athanasius and Asceticism (London: Johns Hopkins University Press, 1995), 167. 26Daniel Keating, Deification and Grace (Naples: Sapientia Press, 2007), 79. I hope you enjoyed this section and that it wasn’t too long. As I’m sure you’ll note, it is still a work in progress with some missing footnotes and more. I’d love comments on it. Let me know what you think. I can hardly believe I’ve been at this for a year. I’ve had many blogs in the past. I believe it all started with Xanga for me. Then I moved to a Myspace blog, then a Facebook blog. After that I discovered blogger and used it to create several different blogs. I was never able to keep one going, so this is kind of a big deal for me. To celebrate, I want first to thank everyone who reads or has read my blog. 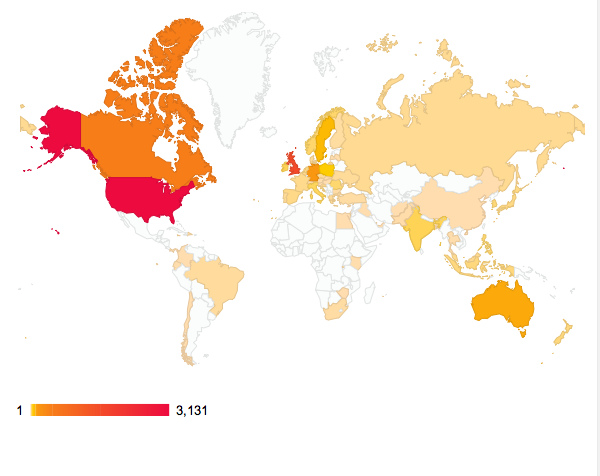 Here is screen-shot I took of density map that shows every country in which my blog has been read. I’m overwhelmed both by the number of people who have read my blog and the diversity of people who have read it. So again I say to everyone who has read my blog, thank you. Here are a few post who didn’t make the top ten cut, but were pretty darn close. Finally, here are some of my favourite blogs and websites I’ve encountered since I started blogging. First is my wife’s blog: My Homespun Haven. She always has great recipes that I get to eat. One of my favourites is her Brown Butter Blondies with Maple Icing and Bacon Sprinkles. Make them and eat them, now. Second is a blog from one of my best friends, Peter Stevens and his blog, Life, the Universe and Everything. Peter primarily does book reviews now, but also posts on particular saints in the Christian past, and many other things besides. Pete’s blog has been going since 2008. One of my favourite posts from Peter is Thoughts on the new Pope and Christian Leadership. Next up is a blog I’ve featured before, it is The Flame Imperishable from Jonathan S. McIntosh. Jonathan is a theologian, philosopher, and Tolkien scholar and he brings all these things together in his blog. One of my favourite posts of his is From Fairy-Story to Evangelion. Then there are the infrequent, but excellent posts from friend and fellow pipe smoker Colin Nicolle. Many of his posts centre around his home in Halifax, his training to be a vicar, and his love of the Latin Verse & a Pipe and listen to the dulcet tones of his voice as he reads ancient poetry to you. From infrequency to incredible frequency we move to Father Aidan Kimel and his blog Ecletic Orthodoxy. Father Aidan is priest in the Orthodox church and many of his posts are commentaries based on very close readings of specific texts by the Church fathers. Check out his post, The Fifth Theological Oration: The Spirit Teaches his Divinity which deals with topics near and dear to my heart, namely, the Spirit and deification. Another blogger I want to highlight is Jarrod Longbons over at The Art of the Good Life. 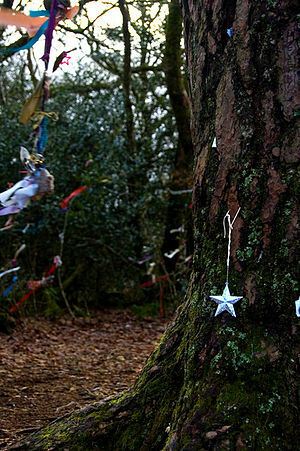 Jarrod writes about anything from interviews with theologians, to commentaries on popular or contemporary culture, to how ecology and theology work together (which is, broadly, the topic of his dissertation at the University of Nottingham). Check out his post Review of the CoTP’s International Conference: “The Soul”. The last blog I want to highlight is written by a former preacher of mine, Craig Cottongim. Craig’s blog focuses more on how we are to live life with splashes of social commentary. His blog is always uplifting and helpful. Check out his post: Distracted by DOMA. Now I want to move to a few websites I’ve come to really enjoy. The first is the Centre of Theology and Philosophy. This is your go to place for all things theology and philosophy, often, but not exclusively, related to Radical Orthodoxy. This website is frequently updated with forthcoming books, upcoming conferences, and also includes drafts of papers written by the members, including John Milbank, Conor Cunnigham, Karen Kilby, and others. Next there is the Theology Studio, run by Scott Bader-Saye and Tony Baker. 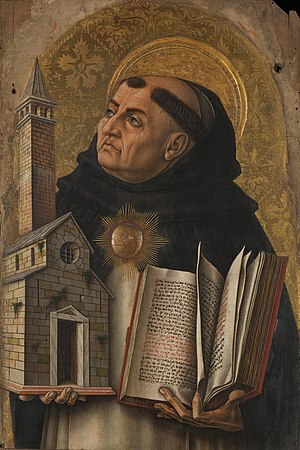 This site includes audio, and some video, interviews with prominent theologians, a blog with multiple contributors, long lists of books that are mentioned, and the three (often more) most influential books for each of the theologians they interview. This is a great place to pick up resources if you’re interested in theology. Finally, there is the Radical Orthodoxy: Theology, Philosophy, Politics Journal. This is a primarily online, and therefore free, journal which doesn’t simply tow the RO party line, but welcomes any and all articles that are concerned with Theology, Philosophy, or Politics, which is to say, nearly anything. I’m told there are some “staffing” changes being made, so we should definitely be on the look out for another online journal soon. They also do a yearly print version which can be purchased through Wipf and Stock. I hope you’ve enjoyed the links. Definitely make sure to go check out the other blogs I linked to above.